Reading about Apert syndrome may seem daunting: that is, until you meet the children. Once you’ve had your heart touched by a child with this rare genetic disorder, these apparent “hurdles” suddenly seem small. 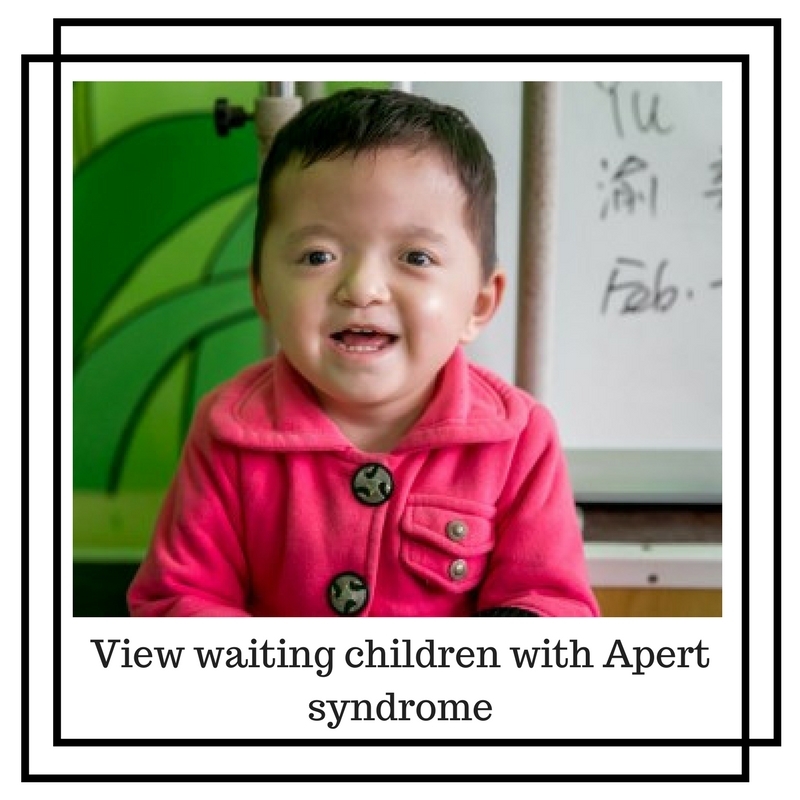 View children with Apert Syndrome who are waiting for adoption now! Apert syndrome is a genetic disorder affecting the 10th chromosome; more specifically, the FGFR2 gene. It is characterized by a premature fusion of bones located at the extremity of the body, namely the head, hands and feet (acrocephalosyndactyly). This premature fusion of certain skull bones (craniosynostosis) affects the shape of the head and face. When the head is unable to grow normally it leads to a sunken in appearance or retruded midface, bulging and wide-set eyes, an underdeveloped upper jaw causing crowding of the teeth and other dental issues and, more often than not, a beaked nose. Early fusion of the skull bones also affects the development of the brain, which can disrupt intellectual development. Cognitive abilities in people with Apert syndrome range from normal to mild or moderate intellectual disability. In addition, a varied number of fingers and toes are fused together (syndactyly) with, on the rare occasion, extra fingers or toes (polydactyly). Causes: Apert syndrome is inherited in an autosomal dominant pattern, which means one copy of the altered gene (from one parent) is sufficient to cause the disorder. Almost all cases of Apert syndrome result from what are called fresh mutations of the gene, and occur in people with no history of the disorder in their family. Individuals with Apert syndrome, however, can pass along the condition to the next generation with a one in two (50 percent) ratio of probability. Children with Apert syndrome thrive after adoption as these children prove! While children born with Apert syndrome will each present differently, the list of other conditions they may have include: obstructive sleep apnea, hearing loss, unusually heavy sweating (hyperhidrosis), oily skin with severe acne, patches of missing hair in the eyebrows, fusion of spinal bones in the neck (cervical vertebrae), gastrological issues, vision issues, and recurrent ear infections that may be associated with an opening in the roof of the mouth (a cleft palate). Other medical issues surrounding the organs (heart, kidney or liver) and developmental/behavioral (ADHD or ASD) have been observed in some cases of Apert syndrome, although it is uncertain whether they were caused by Apert syndrome. Physicians use a multidisciplinary approach to determine the best collaborative process and further improve the health of the child. A craniofacial team may consist of a craniofacial surgeon, neurosurgeon, ENT, audiologist, speech pathologist, oral surgeon, psychologist, ophthalmologist, and an orthodontist. New advances and procedures concerning Apert syndrome are constantly being developed. There are generally recommended timelines for surgeries, starting in infancy, but children in certain countries may not have early intervention. A child can still have many of these same surgeries done effectively at an older age and live a normal life. However, if craniosynostosis is not addressed surgically, it could result in developmental delays, facial abnormalities, seizures and many other long-term health problems. Research has shown that children born with Apert syndrome who are raised by their parents have a better chance of achieving normal intellectual ability than those who are institutionalized. This is yet another powerful reason why it is imperative these children find their families. Please…meet the children who are waiting! Please visit Children's Craniofacial Association to learn more and connect!